San Diego, CA. — Who knew what lay ahead in the wild open spaces of the first Rock `n` Roll Marathon? Some even questioned the concept of rock bands strung along the marathon course in the first place. What does rock `n` roll have to do with San Diego much less with running a marathon? Well, on June 21, 1998 the world got its answer. With the snarl of a blistering guitar solo, the tight rhythm of a snare drum and millions of accompanying footfalls, the second wave running boom announced its arrival in a rollick of music, endorphins, and sweat. Even before its first steps were run, there was the feel of a major marathon about it. Elite Racing founder Tim Murphy had conceived the idea while running the final lonely miles of the Heart of San Diego Marathon one year out along Friar’s Road to Qualcomm Stadium. Wishing there were some kind of support along the road to help out, Murphy thought, wouldn’t it be great to have music to run to. It took a long time for his idea to gestate, but the seed had been planted, and after a decade of developing his reputation as an innovator, Murphy saw his grand design come into full blossom in 1998. No longer a simple feat of speed endurance, the marathon had been transformed into a 26-mile long block party through America’s Finest City. Though there was a 35-minute start delay at Balboa Park due to some traffic issues out on the course, which led to a water-dousing through the first aid station, the high-spirited music rocking the sidelines caused an immediate sensation. Afterwards the nearly 20,000 entrants from 30 countries and all 50 states passed the word, ‘You gotta try this one!” And that was before they got to the post-race concert that night featuring Huey Lewis and the News, Pat Benatar, and the Lovin’ Spoonful! So, too, was year one’s field a group of intrepid explorers, 55% of which were women, the largest such percentage of any marathon to date, and pivot-point in the history of the sport. The course, mostly around Mission Bay, still had a new-car smell. Nobody knew how fast it could be run until young Kenyan, Philip Tarus, busted a 2:10 opener for the men, with Russian women Nadezhda Ilyina and Irina Bogacheva battling just nine seconds apart at the finish for the women in 2:34. That told the athletes of the world, ‘This one is worth having a go,” especially after all the Suzuki prizes and prize money checks were handed out. Who knew what lie ahead in the wild open spaces of the first Suzuki Rock `n` Roll Marathon? Some even questioned the concept of rock bands strung along the marathon course. What does rock `n` roll have to do with San Diego much less the marathon, they asked? 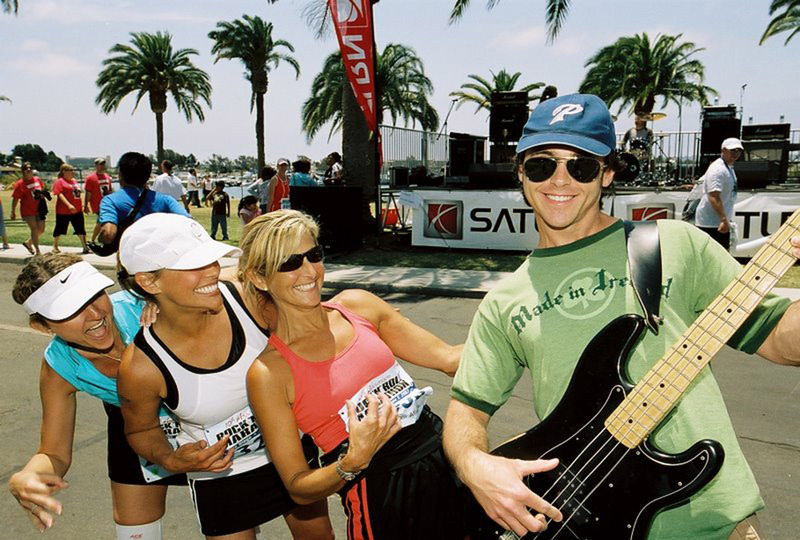 Well, on June 21st 1998 the world heard loud and clear what rock `n` roll had to do with San Diego and marathoning. With a resounding P-A-R-T-Y! the second running boom announced its arrival. No longer a simple feat of speed and endurance, the marathon had been turned into a 26-mile block party by Elite Racing’s Tim Murphy, who could be rightfully called the father of the post-modern running boom. Even before its first steps were run there was the feel of a major marathon about it as Tim brought on high profile Hollywood investors and celebrity ambassadors to help generate funding and interest. Runner’s World also helped turn out 6000 Team In Training runners for the Leukemia & Lymphoma Society. Yes, there was a disconcerting 35-minute delay at the Balboa Park start due to parked cars on the course, leading many a bladder challenged runner to anoint Sixth Avenue before the gun. Then after they were set free, runners overwhelmed the first water stop in the subsequent heat, causing back of the packers to come up dry. Yet the music rocking the sidelines for 26.2 miles caused an immediate sensation. Afterwards the nearly 20,000 entrants from 30 countries and all 50 states passed the word, ‘You gotta try this one!” And that was before they got to the post-race concert that night featuring Huey Lewis and the News, Pat Benatar, and the Lovin’ Spoonful! So, too, was year one’s field a group of intrepid explorers, 55% of which were women, the largest such percentage of any marathon to date. The course, much around Mission Bay, had a new-car smell about it, or was that newly cut wood? City business owners balked when the course design closed traffic on Harbor Island Drive, the main access to Lindbergh Field, San Diego’s major international airport. The last-minute compromise was a temporary plywood bridge that took the runners up and over the traffic, but whose steep cost set Elite Racing back tens of thousands to build, and tested tired runners more than they might have hoped at 23 miles. Nobody knew how fast the route would be until young Kenyan Philip Tarus busted a 2:10 opener for the men, with Russian women Nadezhda Ilyina and Irina Bogacheva battling just nine seconds apart at the finish for the women in 2:34. That told the athletes of the world, ‘This one is worth having a go,” especially after all the Suzuki prizes and prize money checks were handed out. His career as a runner, coach, author and journalist is unique…Now Tom Derderian adds a political wing to his CV. 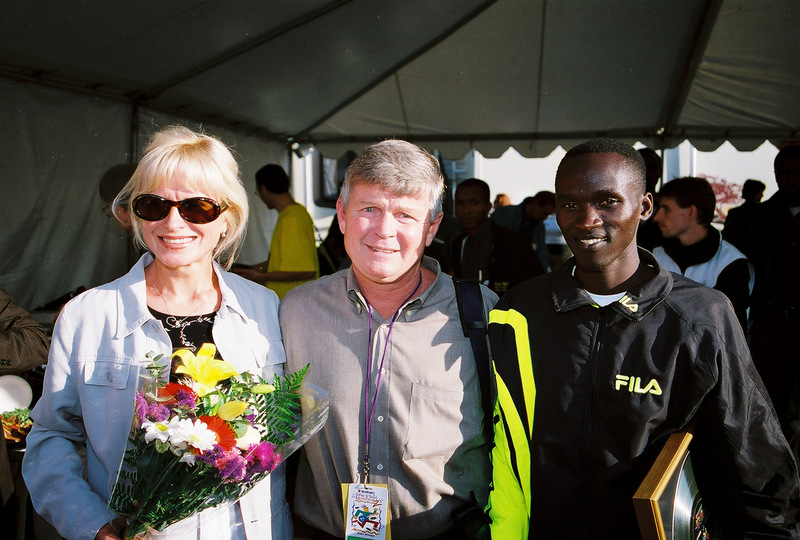 Last Sunday September 23rd the long-time Greater Boston Track Club coach, Boston Marathon historian, and sub-2:20 marathoner was elected new president of the USATF New England chapter. I have known Tom over 30 years, and his passion for the sport of running is as great as anyone I’ve ever met. In that regard, with the presumptive sale of The Competitor Group and its vast stock of Rock `n` Roll Marathons to the owners of the Tour de France, the link between love of the game and hunger for the gain has been stretched farther than ever before. Consider that when Tim Murphy founded Elite Racing in 1988, he did so because he loved the sport and thought he could put on races which other runners would support. First he gave us the seminal Carlsbad 5000, the race which introduced the concept of the 5K to road racing. Then his idea for the Rock `n` Roll Marathon series germinated when Tim found himself all alone slogging along Friar’s Road through the final miles of one of the old Heart of San Diego Marathons. When Murphy sold his business to Falconhead Capital in December 2007, everyone knew how such capital investments worked. Five years is the out-marker lifespan for such capital investments, and thus when word leaked that CGI was for sale, it made all the sense in the world; 2012 was the obvious time for Falconhead to cash out and move on.